With out removing the outdrive from your boat, step by step from upper gearcase. Cobra upper gear case years 1986 to 1996, can be removed from stern drive on the boat, or in the water if need be. Changing the impeller, gasket, seals and housing should take about 30 to 60 minutes. Remove the three 5/16 x 3/4 inch bolts from the plastic cover assembly with a 3/8 inch socket. Remove the three 5/16 inch x 2 inch long bolts from the housing. Remove the tube by cutting the tie strip and pulling tube from the housing. You do not need to remove lower end of vent tube from the upper gear-case. This is what a good impeller should look like. If you are having cooling problems, check flow from the transom hose just before the thermostat, to see if there is a steady flow. This test must be done at the dock not in the driveway with a flush kit. Note, V6 or V8 engines should fill a one gallon container in about 1 minute with an idle speed of 550 to 600 RPM. There may be a leak at the tube were grommets or no grommet was installed. No guide tube was used when unit was put together. No Johnson outboard gasket retaining compound was used on the passage housing, located in the lower gear-case. No gasket or possible leak in the gasket, between lower gear-case base, to bottom of passage housing. If how ever you have a steady stream, check for a leak in the manifold. Leaking air or back pressure may be stopping flow by over powering the flow as the RPM gets above the 1,000 to 2,000 mark. To test, plug both ends of water entry and exit on manifold. Using a bike or car air pump, insert air thru the cork or rubber plug to see if the manifold passage will hold 15 PSI without leaking. Note, boat should to be out of the lake to pressure test the out-drive and check for leaks in the adapter seal area. To test pressure test stern-drive to 10 to 15 lbs. Spay mixture of 50 percent each of household dish soap and hot water. If bubbles appear the adapter or seal needs to be changed. Adapter can be changed without removing out-drive from the boat. Three 5/16 holes must be tapped with a 3/8 national course thread. Three 5/16 inch allen bolt screws must be used to protect screw area. Use 3/8 inch bolts in new tapped holes to pull adapter plate from the Cobra outdrive. 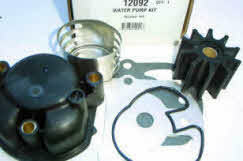 Sample of aftermarket parts with housing included. P/N 12092 GLM Marine inc.